If you are reading this before December 20th 2018, please visit the News snippets page. The Gloucester U3A Choir was formed in 1994. We meet most weeks, except during school holiday periods, on Friday afternoons from 1:30 to 3:00, in Longford Village Hall. Our conductor is John Merrick, and our accompanist Elvin Young. The choir’s aim is to learn and sing music in a way that’s both fun for the members and (although it’s not primarily a performing group) fun to listen to! We do perform twice a year to entertain other members of U3A; we produce a Carol Concert in St John’s Church, Gloucester, each December, and also provide some entertainment at one of the U3A monthly meetings, normally towards the end of June. 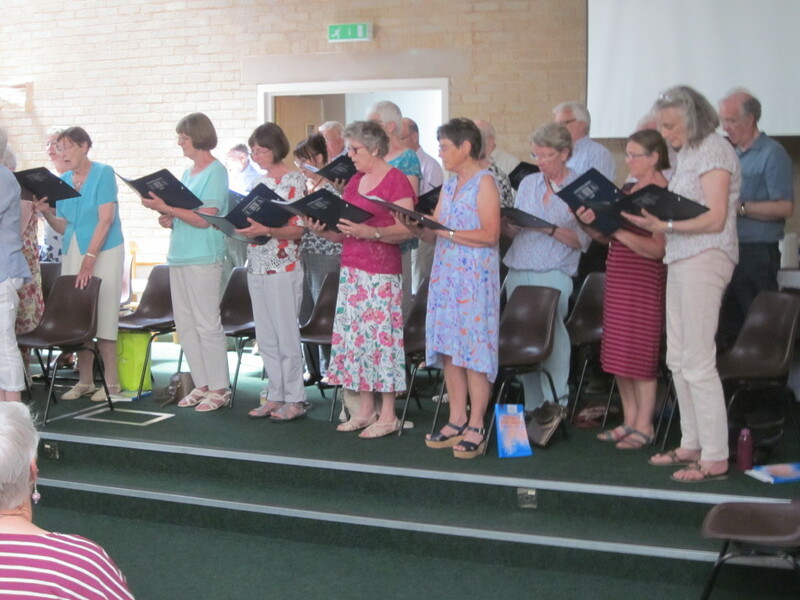 We regularly take part in the Singing Day for U3A choirs from Gloucestershire and neighbouring areas, usually performing a couple of items for the other groups there, and joining with the other choirs in a mass rehearsal and performance. In 2013 we hosted this event ourselves, culminating in a joint performance of Vivaldi’s “Gloria”. The Choir is about 40 strong. New members are always welcome, particularly tenors and basses! You do not have to be able to read music (although a little experience probably helps!) and there are no auditions to worry about. This year’s repertoire ranges from Elgar to Henry Mancini. We sing both accompanied and unaccompanied pieces – and lots of Christmas carols in the Autumn! If you’re interested in joining, please contact John Merrick on (01452)504376.